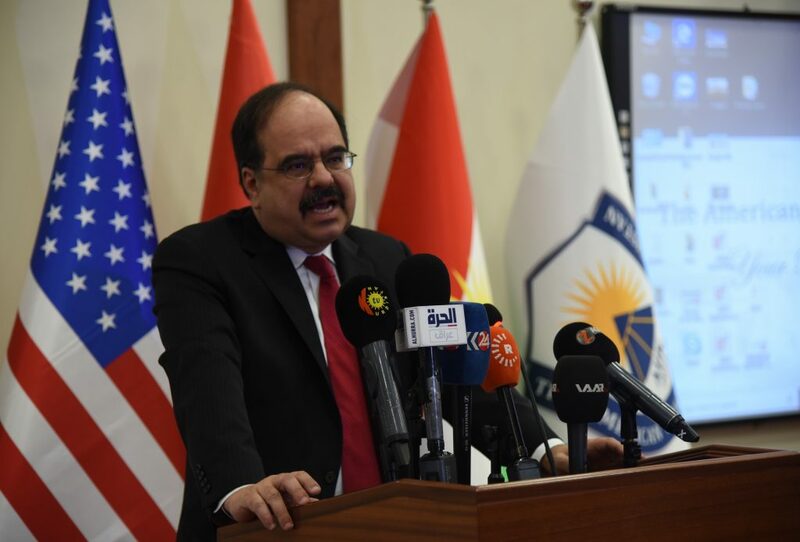 Ambassador Fernandez expressed his gratitude and happiness to be at AUK for the first time stating ‘’I am very happy to be here today to discuss the future of Middle East.’’ In his speech, Ambassador Fernandez highlighted the role of education in providing solutions for the betterment of the region. ‘’There are some key factors to better the way forward in the Middle East and the most important one is humanism, which AUK comes as the perfect example for building such humanistic capacities that will shape the future of this are,.’’ he said. During the hour-long lecture and discussion with students and faculty, Ambassador Fernandez outlined the future of the Middle East and the vital role of education, particularly education that follows the American model. ‘’This was by far my favorite lecture at AUK, ambassador Fernandez opened new doors for researching on the future of Middle East, and answered many questions that any future diplomat can have,’’said Omed Hamdi, a senior student of AUK’s College of International Studies. In addition to his current role, Ambassador Fernandez is a member of the Board of Directors of the Center for Cyber and Homeland Security at George Washington University. He is also a Non-Resident Fellow in Middle East Politics and Media at the TRENDS research and advisory center in Abu Dhabi, United Arab Emirates He is also on the Board of Advisors of the International Center for the Study of Violent Extremism (ICSVE) and the Philos Project.